Ellie Dayhuff (7) is a member of a strong junior class expected to lead Mountain Brook this season. 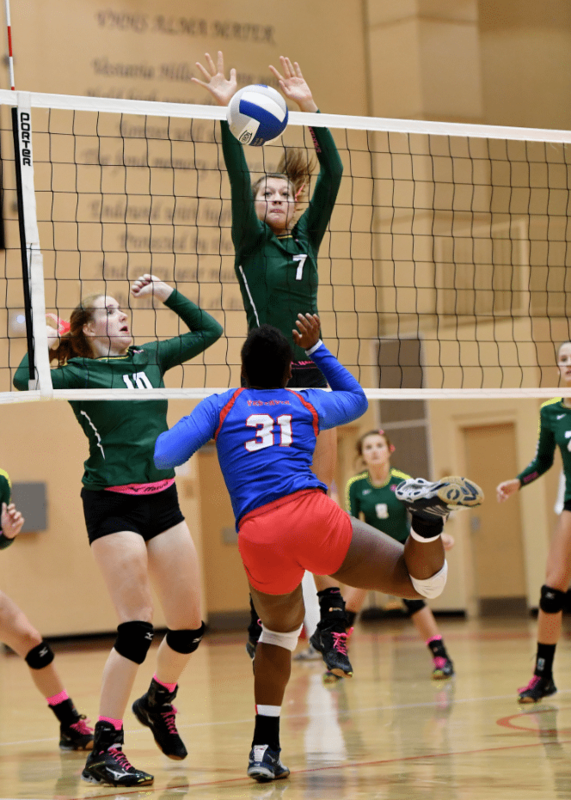 Journal file photo by Lee Walls Jr.
Just one senior – Libby Grace Gann – departed Mountain Brook last season, and this year, the Spartans’ volleyball team will have none. But a large junior class is moving in to help the Spartans surpass last year’s season, in which the team fell in the state semifinals to McGill-Toolen 3-0. Coach Vickie Nichols took over the squad on short notice last season upon the departure of former coach Haven O’Quinn. O’Quinn took the head coaching job at Birmingham-Southern College after capturing three consecutive state championships with the Spartans. That transition created a bit of turnover on the squad, but after a year together and a successful run, Nichols and her players have grown to know each other well. It’s personality that will define their season and how each girl plays an important role in their success. “We’re all seven completely different people, and we’re each bringing something different to practice,” said Vandevelde. Ann’s twin sister, Liz, also is a part of this junior class as libero, along with Ellie Dayhuff as middle blocker. Ann will move to setter for the first time. Vandevelde and Carr are also both expecting early contributions from freshman middle blocker Greer Golden. “Sometimes we forget she’s 13-years-old,” Nichols said. Carr is going to be counted on. While all seven juniors will play an important role, Nichols is hoping Carr will lead. “She has to be depended upon. She can’t have a bad day,” Nichols said. Mountain Brook will open its season Aug. 28 at Bob Jones.